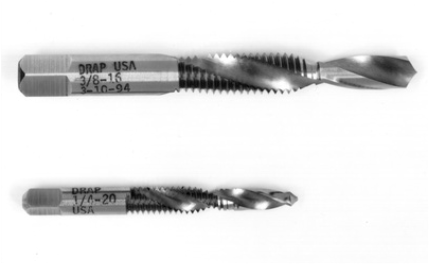 The Drap® is our combination drill and tap tool that saves one full operation during production tapping operations. Offered in both HSS and Cobalt, the Drap® is designed so that through holes up to twice the tap diameter can be drilled and tapped at high RPM. The specially designed drill pilot will produce the correct size hole for tapping. Draps® are offered in all standard taper pipe, NPT, and metric sizes. Copyright 2015 Dreamer Cutting Tools, Inc.